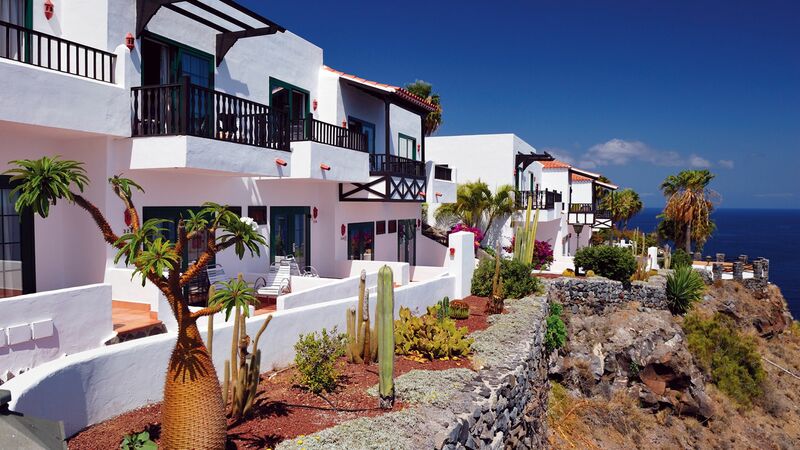 Nestled on the south coast of the small island of La Gomera, Playa de Santiago is a laid back former fishing village surrounded by delightful natural views. The subtropical forests and cliffs provide a beautiful backdrop, while the golden sands and crystal clear waters of the Atlantic are at the heart of the town’s activity. This is the perfect place for active couples or families wanting to explore, or simply relax and enjoy the serene atmosphere of the island. Hiking, watersports, and biking are available for explorers wanting to immerse themselves in the surrounding landscapes, while there are plenty of other sights to explore nearby. San Sebastian de La Gomera, the island’s capital, is just a 45-minute drive away, and is ideal for those wanting to explore on their Playa de Santiago holidays. Here you’ll find the pretty squares and narrow streets traditional of old Spanish towns, quaint churches and a museum dedicated to the explorer Christopher Columbus. There are plenty of opportunities to relax on luxury holidays in Playa de Santiago. This pretty former fishing village is surrounded by subtropical forests and overlooks the beautiful Atlantic. The harbour is where most of the activity is centred, with a selection of excellent restaurants and cafés, where you can enjoy spectacular cuisine as you watch the little fishing boats. Alternatively, take your own boat trip and explore the coastline from a different angle. You’ll see little coves and quiet stretches of golden sands, as well as many varieties of fish below the surface – ideal for keen divers and snorkelers. At Sovereign we’ll help you get the most from your luxury holidays in Playa de Santiago. We include private transfers and selected airport lounges as standard, as well as finding you the ideal holiday for your group. Choose Hotel Jardin Tecina and enjoy spectacular views from its clifftop location, vibrant al fresco dining options, as well as a Kids’ Club which will keep your children entertained as you relax in the spa, or by one of the five swimming pools.